There are quite a few customizations you are able to make to your tours and account. This tutorial will go over many of the common customizations you may want to make on your first tour. To apply the Video Slideshow Mode to your images, scroll to “Video Slideshow Mode” and select On. Using this effect will give motion to your photos in your tour. All tours default to the Zephyr design. However, we do have several other designs you can choose from. To preview them, scroll to Tour Setup, then Design, and select a design from the drop down menu. Next, click on Preview Design. A new tab/window will open up showing you this new design. 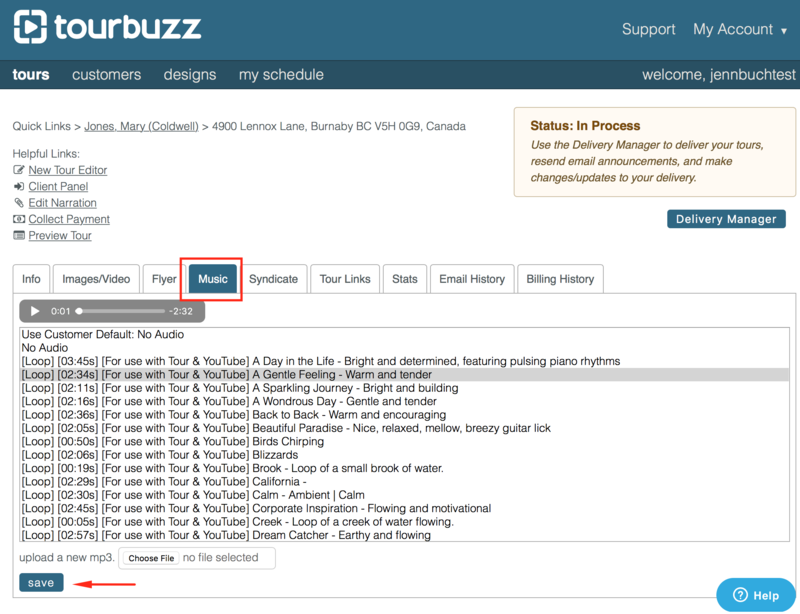 Scroll to the bottom of the Edit page to select Save once you’ve found the design you like. If you have already added your sponsors to your account, simply scroll to the Sponsors section of the Info Tab and select your sponsor from the drop down. Then scroll to the bottom and Save. If you have no sponsors available, you can follow these instructions on adding your Sponsor. *Once you have completed this, you can return to your tour, select edit, then complete the steps to update the sponsor for that tour. To add music, select the Edit option for your tour and click on the Music Tab. We do have several music options to choose from, however, you are able to upload your own music if desired. To do this, click on Choose File next to “upload a new mp3. Once you have selected your file, click Save. This will automatically update your tour with the new music choice. 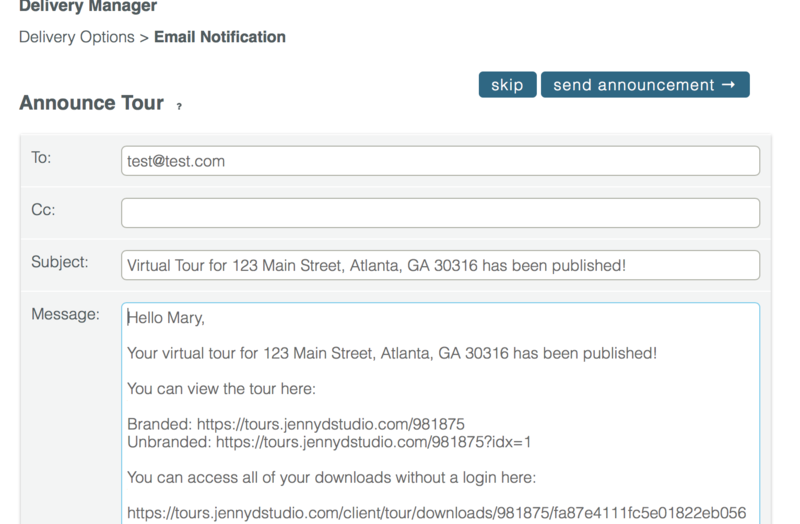 If you would like, you can preview your tour at any time during your customization. Now that you have fully customized your tour, you are ready to deliver it. 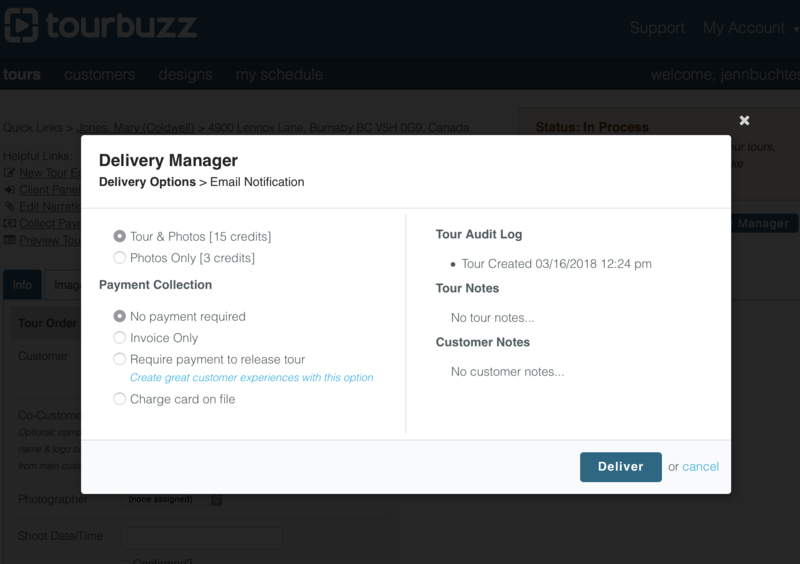 To deliver a tour, click Delivery Manager. Next, select Tour & Photos in the top left of the window and then deliver in the bottom right. Each published tour is 15 credits. If you’d like to only publish the photos (and no tour), select Photos Only in the top left of the window and then deliver in the bottom right. Photos Only are only 3 credits. Once you click deliver, you will be brought to the Announcement Email page. Here you can edit who this email announcement will be sent to, as well as the content of the message. You will also have the option to skip if you would not like an announcement email sent out at this time. Your tour is now delivered! You can edit the tour at any time by going to your Tours page and selecting Edit next to the tour you would like to modify. Saved modifications are updated in real-time to your existing tour.